John C. Zimmerman, “Fritjof Meyer and the number of Auschwitz victims: a critical analysis”, Journal of Genocide Research, 6(2) (2004), pp. 249–266. John C. Zimmerman is an assistance professor for book keeping at the University of Nevada in Las Vegas. Defending the Holocaust Dogma is one of his spare time hobbies. In 2000, he published a “refutation” of Holocaust revisionism.2 Many of his essays have been posted on the Internet mainly by the so-called Holocaust History Project (holocaust-history.org). With the paper discussed here, Zimmerman has been accepted as a kind of official Auschwitz expert. This raises the question, as to why the uncounted numbers of full-time Holocaust experts all over the world do not address the theses published by Fritjof Meyer. Ill. 1: Painting by “witness” David Olère, depicting oven doors some 3–4 feet high.6 The actual oven doors of the Auschwitz crematoria were only a little over two feet wide and high, with two rolls on either side to guide the stretcher, reducing the usable height of the oven doors down to less than 2 feet with the upper part of the door consisting of a round arch (see Ill. 2). Note: 1. The lever law prevents a single man from balancing a stretcher as shown with a weight similar to or heavier than his own – since nothing keeps the stretcher up inside the muffle! 2. It is physically impossible to work with a naked upper body in front of open ovens doors whose inside temperature is 1,400–1,800 °F. 3. No flames can come out of oven doors of coke-fired ovens. In other words: Olère and others making similar claims are liars. Right at the beginning Zimmerman states that he only bothers discussing Meyer’s hypothesis because Meyer’s victim number has the potential to get into the mainstream, where it could be quoted as an acceptable number by authors and historians not familiar with the demographics of Auschwitz (p. 249). And that has to be prevented, Zimmerman claims. On pp. 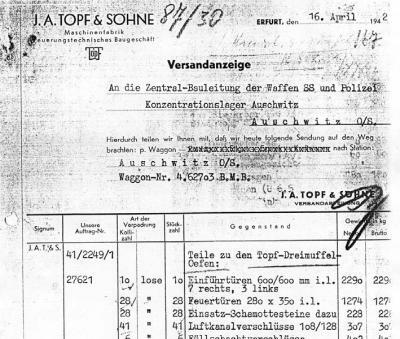 250–255, Zimmerman tackles the questions: how many prisoners were deported altogether toward Auschwitz railway station, how many of them were registered in the camp, and how many of those not registered were either transferred elsewhere or killed by gas? Revisionists and exterminationists argue only what happened to those inmates, about whose fate we have no other evidence than general witness statements. “No information” means in plain English: no information also about their alleged fate of having been gassed. That there are indeed cases where it can be shown that deportees sent to Auschwitz, but not registered there, were not killed by means of poisonous gas, is even admitted by Zimmerman. As an alternative to the claim of immediate extermination on arrival, he mentions that during 1944, thousands of Jews deported from Hungary and Poland were temporarily quartered in the transit section of the camp (Durchgangslager) before transferred to other camps. These inmates never received any registration number assigned (p. 252). Of course, Zimmerman cannot come up with a single document indicating the mass murder of unregistered deportees, but he quotes a document which deals with the mass transfer of unregistered Jews to other camps. This is a memo written on May 29, 1944, by First Lieutenant Ferency, delegate of the Hungarian Ministry for the Interior for the deportation of Jews.3 In it Ferency explains that 184,000 Jews had been deported the previous day and that the Security Police requested that the Jews get food for five days, because they were to be transferred by train to various labor camps after their selection at Auschwitz (p. 253). Zimmerman argues that all those Jews not registered in Auschwitz and about whose fate we have no other evidence were gassed in Auschwitz. Ill. 2: Oven doors of the type used in the Auschwitz crematoria. Rolls to guide stretcher marked with white ellipses. In other words: inmates, about whose fate there was no information for many years, suddenly turned out to have been very much alive. How is it then possible to claim, as Zimmerman is doing it, that all those inmates, about whose fate we still have no information today, died “in the gas”? Zimmerman is correct when claiming that many German authorities were instructed toward the end of the war to destroy their archives (p. 256). But that is a measure taken by all countries who are threatened to be occupied by enemy forces. If each and every such destruction of secret archival material would prove a Holocaust, then we would have one Holocaust after the other everywhere in the world. It remains a fact that the absence of evidence cannot serve as proof for a claim. But that is exactly what Zimmerman is doing. That flies into the face of scientific methods. An analysis of Zimmerman’s chapter about the capacity of the crematoria in Auschwitz, starting at p. 255, quickly reveals how weak the basis is upon which Zimmerman tried to erect his thesis. Comparable to the earlier works by Pressac, Zimmerman as well considers it unnecessary to consult technical expert literature or to perform his own technical calculations when trying to solve a technical problem. He relies completely upon witness testimonies and documents, which he picks selectively without any critical analysis. It is also indicative that Zimmerman does not mention the works of his arch enemy Carlo Mattogno with a single word in this paper. Until recently, attempts in refuting Mattogno’s works was one of Zimmerman’s main objectives.5 But when publishing in an allegedly scientific journal, he suddenly forgets the most important scientific principle: to mention and discuss contrary evidence and opinions. So much for Zimmerman’s scholarly standards. 1. He declares that the furnaces at Birkenau had a performance as similar ovens in other camps (Gusen camp, pp. 257f). He ignores that the furnaces in Birkenau were inferior to those other ovens, because they did not have forced draft blowers. 2. He claims that the emaciated corpses of Auschwitz could be cremated faster (p. 258), ignoring that, first of all, the claimed gassing victims would not have been emaciated – that would have been true only for inmates incarcerated for an extended period of time and suffering and/or dying from either serious diseases (diarrhea, typhus) or malnutrition. Additionally, emaciated corpses with a low body fat content do not burn faster than corpses with an average content of body fat. 3. He misinterprets a memo by Kurt Prüfer, the engineer responsible for constructing the Birkenau crematorium furnaces, stating that the Birkenau three-muffle ovens had a performance ⅓ higher than those of double-muffle ovens, as a reduction of cremation time by ⅓ (p. 258). Performance, however, is a physical term meaning energy per time and corpse. The time required for a cremation was not effected, but the energy, because the three-muffle ovens had only two fire places heating three muffles, so that almost the same energy was required to heat three muffles with three corpses as was required to heat two muffles with two corpses. b) almost all modern crematoria operate with gas burners embedded in the muffle walls, which work efficiently only when they have a minimum distance from the coffin. But even in such cases, the cremation of multiple corpses at once can succeed only if the fuel consumption is increased accordingly, which, as Zimmerman himself writes, lead to a fire in one of the cases he quotes, because the overcrowded muffle lead to an overheating of oven and flues. 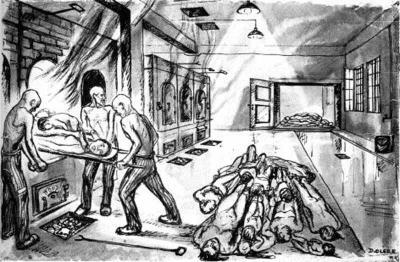 Documents as well as pictures of the ovens in Auschwitz prove that they had been designed for single corpse cremations only. For example, the oven doors were only 600 mm x 600 mm small (23.5 inches), the upper half of which was a rounded arch. (See illustrations 1–3 and illustrations on page 463 of this issue). Zimmerman doubts the times given by Meyer – who is in turn relying on Mattogno’s statements – during which the crematoria were inoperable. He conjectures that repair orders for oven doors do not necessarily mean that the affected ovens had been shut down. This may or may not be the case. Due to lack of more detailed information, we can currently only speculate about that. 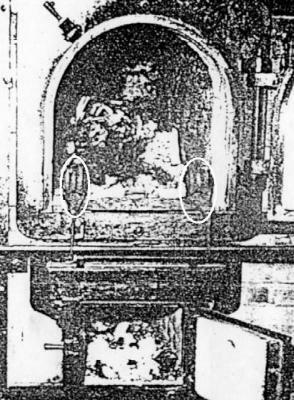 But the fact is that Mattogno has documented many cases where the crematoria were indeed inoperable – Zimmerman ignores them all –, and in some cases, where Mattogno had only insufficient data, he has estimated cautiously. For long periods of time during the existence of the crematoria, we do not have any documents about their activities. But instead of following Zimmerman’s method: “the lack of evidence proves that the crematoria did not operate,” Mattogno assumed the worst case: Where there is no evidence, he assumes full operation of the ovens. Zimmerman’s statements about the alleged open air incinerations in deep pits contain nothing new, perhaps apart from a reference to a more recently released British air photo of the Birkenau camp, where a small plume of smoke can be spotted rising from the back yard of crematorium V. Zimmerman claims that this smoke rises from a mass grave (p. 261). Although he could cope with quite a lot, so he continued, the psychological torture he was exposed to by his wardens was too much for him. Here we see the typical tactics “with a carrot and a stick,” which was mastered in particular by the Stalinist henchmen, who held Höß captive: First an inmate is mistreated by the “evil” guys, and after that the “good” guys tell him that this will not happen again and that he will be just fine, if only he is cooperative with their demands. As is known, Höß was treated so well by the Poles that shortly thereafter he was dangling from the Gallows. So much about Zimmerman’s exactitude and reliability. It was positively mentioned by Sven Felix Kellerhoff, “Interpretationen und Ideologie”, in the German daily Die Welt, Sept. 21, 2004. Holocaust Denial. Demographics, Testimonies, and Ideologies, University Press of America, Lanham, MD, 2000. Lieutenant Colonel Ferency, Representative of the Hungarian Secretary of State for the deportation of Jews, IMT, Blue Series, Vol. 4, p. 367. Concentration Camp Stutthof and its Function in National Sozialistischen Jewish Politics, 2nd ed., Theses & Dissertations Press, Chicago 2004, pp. 91–95. See www.holocaust-history.org/auschwitz/body-disposal/; ~/auschwitz/response-to-mattogno/. Mattogno’s replies to this: www.vho.org/GB/c/CM/jcz.html; www.vho.org/GB/c/CM/Risposta-new-eng.html. They are called “Heizer” (stoker); C. Mattogno, Special Treatment in Auschwitz, Theses & Dissertations Press, Chicago 2004, pp. 101ff. Cf. C. Mattogno, “The Morgues of the Crematoria at Birkenau in the Light of Documents”, TR 2(3) (2004), pp. 271–294. Cf. C. Mattogno, “On the Piper-Meyer-Controversy: Soviet Propaganda vs. Pseudo-Revisionism”, TR 2(2) (2004), pp. 131–139. Cf. my Contribution “England’s Keele University Spreads Holocaust Propaganda” in this issue. R. Höß, in: M. Broszat (ed. ), Kommandant in Auschwitz, Deutsche Verlags-Anstalt, Stuttgart 1958, p. 151. More about that in my expert report, The Rudolf Report, Theses & Dissertations Press, Chicago 2003, pp. 199–201. Source: The Revisionist 2(4) (2004), pp. 449-452.